After runaway success of two video series Bachat Nivesh Badhat and One Idiot IDFC is back with 6 small movie series called as “World according to One Idiot”. One Idiot video was on Financial Management, while “The world according to One Idiot” is series of 6 small video of 2-3 minutes which answers some of the basic questions of finance in an entertaining way. These short films are conversion between Abhi (IT Professional) age 25 years and Varun (Struggling actor) age 22 years. This video can be viewed on one idiot website and also on youtube. Listed below are the questions that are answered by this video series. Film 1: What is financial independence? In first film Abhi and Varun discuss about financial independence. Abhi gives definition of financial independence as. When you don’t ask money from your parents. In this second film Abhi explain to Varun about way to be financially independent. Abhi explain about power of compounding using simple example he says if you save 10,000 rupees a month for 40 years you would have saved 4.80 lakh. If you invest it at 12% rate of return, at end of 40 years 4.8 lakh would have grown to 1.03 crore. So in order to become financial independent you should start investing money in to asset class which gives you return as per your goal. In third film Abhi explain about how to pick your investment, Abhi use wonderful analogy of CRICKET with investment he said “In cricket har ball pe chakka nahin mara ja sakta”. A great scorecard means great combination of 1,2,4,6. 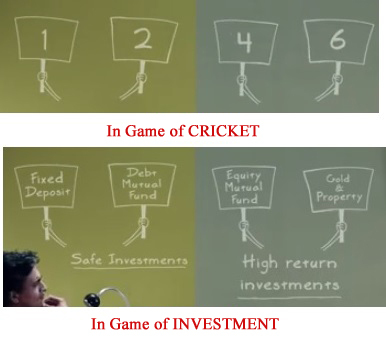 He compare 1,2 in cricket with safe investments like Fixed deposit and Debt Mutual funds & 4, 6 in cricket with high return investments like Equity mutual funds, gold & property. In forth film Abhi explains about concept of SIP (Systematic Investment Plan) and advantage of SIP. In fifth film Abhi explain about importance of life insurance and health insurance. Once again analogy of cricket comes that one may look like Virat Kohli, bat like Yuvraj and adjust like Sachin but once gets out nothing, similarity if you fall sick nothing you have to spend your money but if you have taken health insurance you need not worry about money. In sixth film Abhi explains about need of financial advisor. Abhi asks Varun about how he buys a product. Varun replies he asks his friends, checks on the net gets user feedback, reads magazines get expert opinion before he buys. Abhi says that Just like that one needs to do home-work or research to ask the right questions to financial advisor. We recommend you to watch these movies, with your kids if possible, its worth to spent 15 minutes. « Check how good is your credit score?